We are near wrapping up the heads for the latest Porsche wildness coming out of Flat6Innovations. Late fall of 2011 Charles Navarro, President of LNEngineering drove his 2010 Cayman down from Momence, IL to the Flat6 facility. They yanked the 9A1 3.4DFI lump out and took that bad-boy apart. The plan; Charles shipped the block back to his facility to increase the bore from 97mm to 104mm. I won’t go into the rest of the engine details, those guys will see to that. 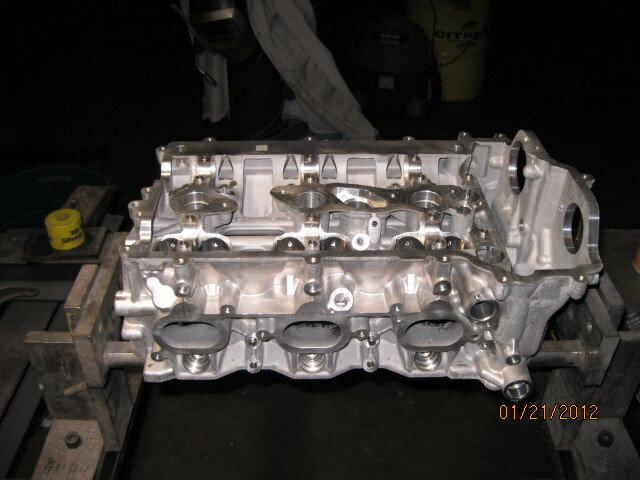 My role is to make sure heads built for a 3.4l engine are up to the challenge of a 4.2l. We started with a trip to the EP3523Ultrasonic cleaner. Ultrasonic cleaning of this complex casting with it’s maze of oil galleys and beautiful shiny surfaces was a real necessity. There was no way I was letting these units near the media blaster. Ultrasonic cleaning is a must for these heads. From there it went onto my HAM built 360* rollover stand for inspection. Many photos were taken and much time was spent admiring and studying this remarkable,striking piece. The casting is intricate and very complex. I can’t recall a more complex cylinderhead casting. And while it is a beauty to behold it is a bit hard on the finger tips. There are countless machined surfaces that left behind a seemingly endless collection of sharp edges. Makes for a serious tactile assault. Fortunately the sharp edges are of no consequence and aren’t worth the countless hours it would take to smooth them all out. I was just careful not to bleed on them . After making a plate for the flowbench and a valve controller we ran the head on the flow bench to gather baseline data. Next I made silicon port and chamber castings for 3-D viewing. This helps determine which areas need improvement. Click here to take a look at the castings and flow data. This was a fun project for us and after driving the Cayman with this incredible engine I can say with a reasonable amount of certainty that I would probably lose my license if this was my DD. It’s just that much fun!